The main draw of a deck for many homeowners is the entertaining space it creates. 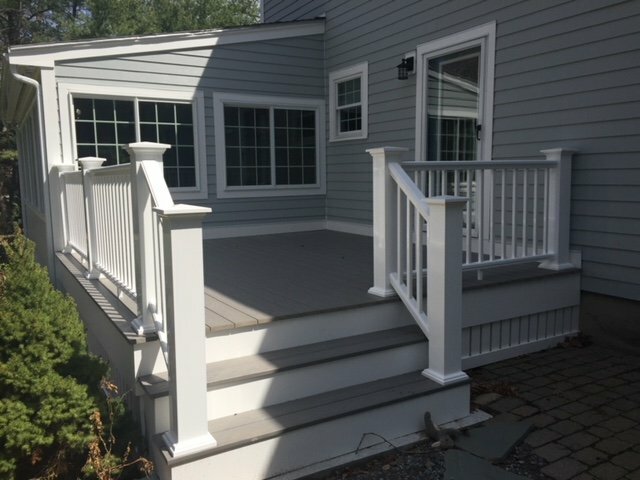 From hosting a BBQ, to a graduation party, to simply enjoy a warm spring or summer night with your family, adding a deck creates a space for you to enjoy the warm New England weather. Adding a deck onto your home can significantly raise it’s resale value. A deck is a desirable feature for homeowners as it indicates that you’ve added extra amenities to increase the functionality of your home. Adding a deck will certainly lead to a higher resale value for your home. Another benefit on installing a deck on your home is that it increases your home’s curb appeal, which in turn leads to an increase in your home’s property value. If you have the only home in your neighborhood with a deck, it will help your home stand out from the competition and increase your home’s value. Furthermore, the material that you use can help increase the curb appeal as well. All of the composite materials we offer look fantastic, and will surely increase your home’s curb appeal! If you’ve run out of space in your garage or shed, constructing a deck can be a great way to create additional storage space for your furniture or outdoor decorations. From potted plants to lawn furniture, a deck can be a great way to add personality to your home’s exterior while freeing up valuable storage space. Building a home addition takes a long time. Depending on what you’re constructing, adding an addition could take months. A deck, on the other hand, can be constructed quickly. From start to finish, it is feasible for a deck to be finished in just a couple of weeks. If you are interested in adding a home addition but you don’t want to wait all summer for it to be completed, consider installing a deck! Compared to other home additions, adding a deck is far cheaper. If you’ve been looking for an inexpensive way to add value to your home, building a deck is a great way to increase your living space without breaking your budget. If you’re interested in installing a deck on your home this spring or summer, reach out to our team for more information! We can be reached over the phone at (978) 957-1200 or by filling out our online contact form. We look forward to hearing from you!